Dickens was born on February 7, 1812, in Portsmouth, England. The second of eight children and the son of a Navy clerk, the family moved often to where his father could find work. During his school years, Dickens worked 10-hour days at Warren’s Blacking Warehouse, where he earned six shillings a week pasting labels on pots and boot blacking. The harsh working conditions made a lasting impression and later influenced his interest in themes socio-economic and labor conditions that occur in many of his essays and works of fiction. That same mentality is echoed through the themes of the very story itself. 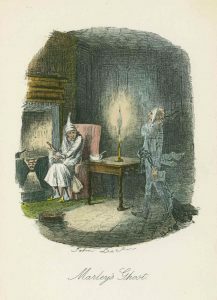 A literal Christmas “Scrooge” is swept away by the spirit of the holiday and transformed into a generous, merry man. He showers the citizen of London with Christmas joy as he runs through the cobblestone streets, shouting good tidings. “No fog, no mist; clear, bright jovial, stirring, cold; cold, piping for the blood to dance to; Golden sunlight; Heavenly sky; sweet fresh air; merry bells. Oh, glorious! Glorious!” Dicken’s description of Christmas day in A Christmas Carol rings true of London today. Visit England with AESU and experience the holiday spirit that overwhelmed Dickens! This entry was posted on Thursday, December 8th, 2016	at 3:59 pm	. You can follow any responses to this entry through the RSS 2.0	feed. Both comments and pings are currently closed.